Background: Amidrazones have been reported to have significant anti-tumor properties against several cancer cell lines. Objectives: The current project aims to profile the structure-anticancer activity relationship of phenyl-amidrazons. Methods: Fifteen phenyl-amidrazone-piperazine derivatives were prepared and tested against four cancer cell lines (leukemia, prostate, breast and colon cancers). 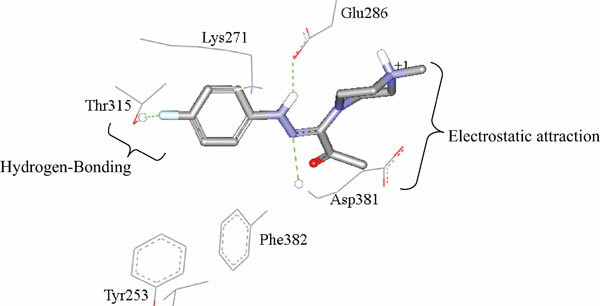 Results: Six compounds illustrated low micromolar anticancer IC50 values, while the remaining compounds were either inactive or of moderate potencies. All compounds were virtually nontoxic against normal fibroblast cells. Conclusion: Docking into the oncogenic kinase bcr/abl illustrated the critical importance of (i) phalogen substituent on the ligand's phenyl ring and (ii) the presence of positive ionizable moiety at the ligand's piperazine fragment for anticancer activity. Aryl-amidrazones, anticancer bioactivity, docking, SAR, electrostatic attraction, hydrogen bonding.